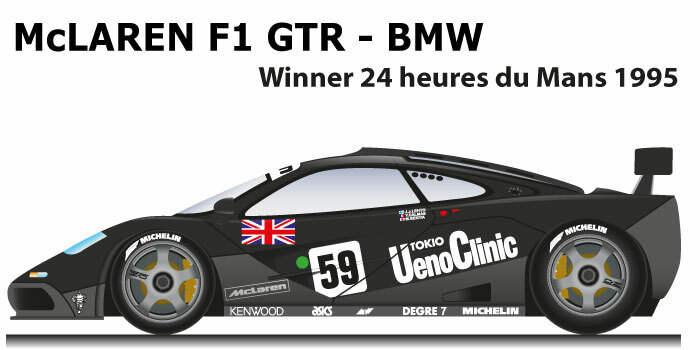 The McLaren F1 GTR – BMW n.59 is the winning car of the 1995 Le Mans 24 Hours. The competition car derived from the road car was designed by engineer Gordon Murray. The F1 GTR was equipped with a 470 kW BMW S70/2 engine, and compared to the road version weighed 100 kg less. Dalmas, Lehto and Sekiya won the 1995 Le Mans 24 Hours with the McLaren F1 GTR – BMW n.59. The trio won in front of the Courage P34 of Wollek, Andretti and Helary, detached from a lap while third at 2 laps, the McLaren n.51 of Wallace, D.Bell and J.Bell. McLaren won Le Mans at the debut and occupied four positions in the top five places. The F1 GTR proved to be very successful also in the BPR Global GT Series Championship.